TRENTON - For the first time, the largest state employees union is pitching its plan for a health-care proposal through the media, directly to taxpayers. For the first time, a governor is refusing to even talk about health care during contract negotiations with the biggest employees union. And for the first time, unions say, local governments throughout the state are taking cues from the governor and shying away from collective bargaining. Trenton is getting its first glimpse of union negotiations under Gov. Christie, and both the governor and the unions say it is unlike anything anyone has ever seen before. "Sorry, it's a new game in town, and they're going to have to get used to it," Christie said Thursday. Already, the rhetoric has been raised: The Camden police union president read a quote from Adolf Hitler this week to a reporter from the Courier-Post of Cherry Hill, implying that both men worked to dismantle unions. Christie has repeatedly criticized Camden police for not taking contractual concessions to avoid layoffs, and he has repeatedly claimed - falsely - that officers get their birthdays off. "Everyone all over the country has heard how the governor has attacked police, fire, and teacher unions," John Williamson, the police union leader, told The Inquirer, adding that he does not think the governor is racist. "All I am doing is drawing a parallel between the two people and some of their actions. The governor's comments and statements are a matter of public record. It's all over YouTube." Christie, who visited a public school in Newark on Thursday and told students that he loved public education, has also declared his "love" for "adversarial" collective bargaining. That seemed to differentiate him from Republican governors in the Midwest, particularly Wisconsin, who have worked to cut public workers' ability to collectively bargain. But Christie still wants to move discussions about health care off the negotiating table and into the Legislature, saying costs must be controlled through passage of a new law. Benefit costs contribute to the state's deficit more than anything else, he says. 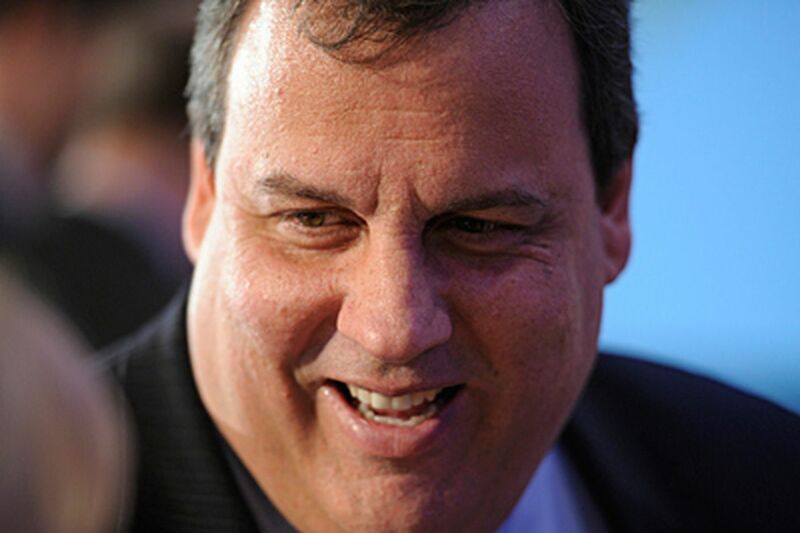 The largest state union, the Communications Workers of America, brought a proposal to Christie at its first negotiating session last Friday that it said would significantly increase what its 40,000 workers pay for their health care. Currently, CWA members pay an average of 8.5 percent toward their premiums; the CWA says its new plan would have members paying the equivalent of 22 percent, including increased costs for doctor visits and prescriptions. There would be total savings of $240 million in the final year of the four-year contract, which is set to start in July. Christie won't even consider the proposal, he said. He wants the Legislature to pass a law that would require all public workers in New Jersey, including teachers and police officers, to pay 30 percent of their health-care premiums, plus co-pays for doctor visits and prescriptions. But that would take health care out of the negotiating process forever, unions fear. "The long-established right for public workers to bargain over health care would be completely eliminated," said Robert Master, CWA regional political director. Christie has a powerful ally, though, in State Senate President Stephen Sweeney (D., Gloucester), a leader of the ironworkers' union. Sweeney has sponsored a bill that would ultimately have the highest-earning workers paying 30 percent toward their premiums. Christie praised Sweeney on Thursday and said the unions are "not calling the shots anymore." "They're uncomfortable, and when they get uncomfortable, they start whining and moaning and complaining. You wont hear any whining and complaining from the governor's office," he said. The CWA said it has had a legal right since 1968 to negotiate health care, and its proposal includes other measures, such as wellness plans that incentivize quitting smoking. Such measures, which would have long-term cost savings, would never find their way into employee heath plans if collective bargaining is eliminated, the union said. "Collective bargaining brings about creative solutions," said Hetty Rosenstein, CWA New Jersey director. Christie has justified looking to the Legislature to overhaul benefits by saying that the union had certain benefit levels locked in by law in 2007. But Rosenstein said that law was passed after an agreement was reached at the negotiating table, and actually reduced worker benefits. Still, Christie said, he hopes his stance will "set a tone for labor negotiations throughout the state," and union leaders said Thursday that that's exactly what has happened. CWA Local 1036, which represents 1,100 Burlington County employees, said it has had multiple bargaining dates canceled just as Sweeney and Christie offered their health-benefits proposals. "This is another example of how this legislation is paralyzing collective bargaining throughout the state," said Adam Liebtag, CWA Local 1036 president. A spokesman for the county, Ralph Shrom, said just one date had been canceled because an attorney couldn't make it, but two others have been held. Another negotiating session is set for March 31. Inquirer staff writer Darran Simon contributed to this article.